Inevitably, the team that I’m assigned to begins to tail off by midweek and, come Thursday, has little to no tail left. The 30th anniversary is not looking to break that streak, at the moment. With one round of doubles left to play, we are several points behind Roy Emerson’s Wankers, my team of last year (true to form, we finished fourth a year ago; in 2017, the Wankers are poised to win it all). I’ll let you know how that turns out in my next blog. The Texas weather has remained remarkable. Thursday morning (as I write) even improved upon a near-perfect Wednesday, with a thin cloud cover more or less neutralizing the effect of a bright sun, and temps in the mid-seventies. Apparently, I need imperfect conditions to thrive. War stories night—Newk moderating, Rocket and Charlie Pasarell thinking about what they’re going to say. On Wednesday, I lost a somewhat interesting singles match to one of Newk’s Mongrel Kangaroos, a lanky (6-4) pharma executive from Granite Bay, California named Tony Jelinek. Tony was better than me in every facet of the game—forehand, backhand, serve, net play, foot speed. If I’d bothered to look in last year’s directory, I wouldn’t have even shown up, since it stated he’d been undefeated that year in both singles and doubles and had won the Kangaroos’ MVP award. Yet, somehow, I was up 4-1 in the first set, with the changeover complete and Tony holding the balls, ready to serve. And then Newk stepped onto our court and without glancing at me, walked slowly over to my opponent and began lecturing him. This went on for several minutes. Now I could have told Tony how to beat me in 20 seconds—slow down, don’t overhit, he hasn’t got one thing that can hurt you. Why it took Newk so long in beyond me. Given that I have yet to win a set—the coaches continue to imagine I’m a younger, stronger, more talented version of myself—I suppose this is flattering … of them and of Newk. Wednesday night was the drinking contest, and Newk’s squad were so dominant that two members of the opposition never even got to chug. 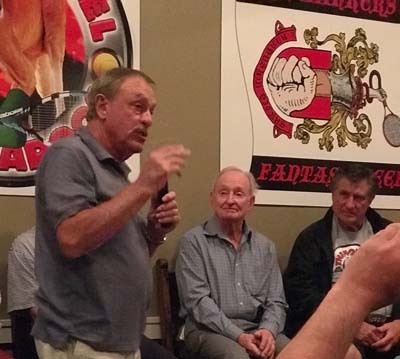 Preceding it, though, was another thoughtful discussion—the panelists were Emmo, Rod, Fred, Ross Case, and Charlie Pasarell, and the topic was stories from their early years as a pro. Emmo told his Onny Parun anecdote, the one where the New Zealand journeyman had to pay with a cork in his mouth, tied to a button on his shirt, to keep his neck from stretching. I’ve heard it eight times now (twice in Switzerland) and it never gets old. Case told the story of how he got his nickname Snake, which involves the early-days’ tradition of private housing, the hostess he found himself with at one tourney, and … well, you can guess the rest. And before all this, Doc Eden told some more jokes. It’s already late in the day on Thursday, but I’ll save today’s activities for the next blog. Suffice to say, in the last possible competition, in the last possible moment, on the last possible point … I won a set.